As HD/4K screens have become the norm for most tech users, working on a decent monitor has become an essential part of my design set up when creating on-screen graphics. I can’t be without one! 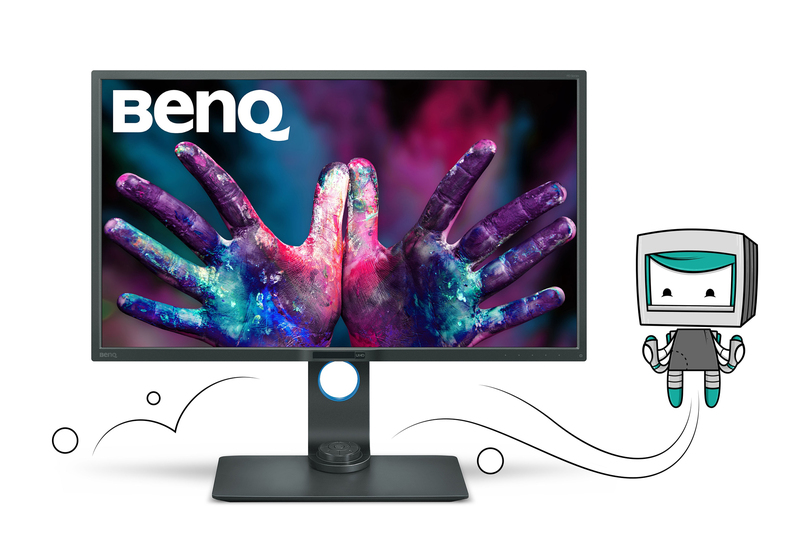 Having previously used BenQ’s BL3201PT, I had high hopes for their PD3200U model which is from a newer line of monitors built specifically with designers in mind. The core specs are everything I expected from a designer’s monitor; 32 inch 4K2K 60Hz display, IPS technology (178 degree viewing angle), plus ultra-precise colour rendition (100% sRGB colour) with support for 1.07 billion colours. See the full specs here. The ports include a 1.2 Display Port, Mini Display Port, 2 x HDMI 2.0, an SD Card reader, plus a headphone jack. It also has It has 4 x USB 3.0 ports (2 upstream and 2 downstream) which work with a KVM switch, allowing you to use your mouse and keyboard on the same monitor for 2 different computers. This is one of the most handy features for me, as it allows me to quickly switch between my laptop and desktop machines without compromising on screen space or messing around with cables. The monitor calibration was just right out-of-the-box and I didn’t need to carry out any adjustments, but it does have a comprehensive set of calibration controls for those who want to fine tune things, plus an OSD puck controller which you can use to quickly switch between different pre-sets and various options. I won’t go through all of the calibration modes in detail but the noteworthy for me were the CAD/CAM Mode (which switches to a high-contrast to help wireframe meshes stand out for modelling work) and the Low Blue Light modes (designed to give a warmer tint making viewing easier on the eyes). Being able to quickly switch to a Low Blue Light mode was a big selling point for me with previous BenQ models as I’m prone to getting tired eyes and headaches when I work into the evenings. The flicker-free screen is a plus too! The monitor design itself is a bit chunky-looking but the build quality is robust which is a good trade off. The base has a nice matte finish with a neat little recess for the OSD controller and a relatively small footprint, so once it’s nestled into my desk space it feels a lot less bulky. Like the BL3201PT I reviewed before, the stand is fully adjustable allowing you to move the monitor up and down, tilt, and rotate to a full 90 degrees. I tested out a few games on it too and for a casual easy-mode gamer like me it felt more than sufficient, but competitive gamers may find the 60Hz refresh rate and 4ms response time to be a let down. To be fair to BenQ though, this model hasn’t been designed with gamers in mind. Price-wise, the PD3200U is fairly expensive but good value compared with similar monitors on the market. Overall, it’s lived up to my expectations and I’m really happy with it. Ooh, looks great, been looking for a new monitor for my desktop… is the robot included or is that extra? ?